Daniel and AnnaMarie Miller Family: Checkin' em out! 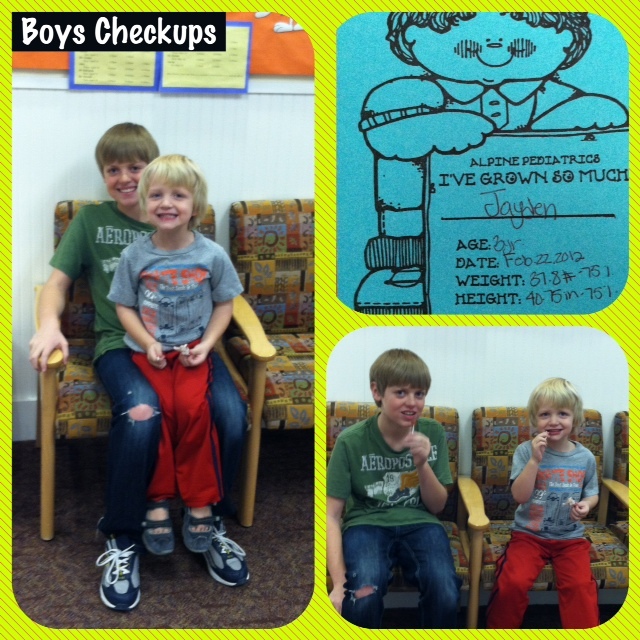 A couple of days ago, Jayden and Mason had their annual checkups. Both of them needed shots since Mason is due for his 7th grade booster(s) and Jayden was behind on his immunizations (bad mommy). Now it was Jayden's turn. I was a little worried about how he would do with the shots. Jaxon is always so tough and has a really high pain tolerance, but Jayden is such a softie. He cries easily and gets scared. Typical baby of the family :) Jayden measured above the 75th percentile in height and in weight both. He is barely 2 inches shorter than his big brother, but Jaxon has an additional 25% on him in weight! He was on track for all developmental milestones and enjoyed showing the doctor all the things he could do. All 3 boys are healthy as could be and Savannah has her checkup today. She's the only one who won't need any immunizations, so it should be a cake walk! It's anyone's guess who will be the tallest kid in the family. The only thing we know for sure is- it won't be Savannah!